For 48 hours, Theresa May looked as if she was in control of her government. Last Friday, Britain’s embattled leader called all her ministers to the bucolic prime ministerial bolt hole at Chequers. The UK cabinet, almost two years to the day of the Brexit referendum, would finally agree a collective position on leaving the European Union. Any ministers that did not sign up faced the prospect of a long walk home – ministerial cars would be immediately withdrawn. That evening, to the surprise of many, May emerged with an agreement. The so-called ‘Chequers deal’ was heralded as a major breakthrough. On Friday evening, the BBC reported that May had emerged with her position greatly strengthened after every cabinet minister endorsed her proposals. Afterwards Conservative leader sounded an unusually bullish tone, telling one British newspaper that it was up to the European Union to step up to the mark. “It’s now for Europe to be prepared to sit down and move the pace of negotiations on and talk about it seriously and address what we’ve put forward,” she said. But by Sunday evening, such confidence had evaporated. Hardline Brexiters had already begun to voice their disquiet with the Chequers plan. Maintaining a “common rule book” for goods with the EU, collecting tariffs on behalf of the EU, free movement for skilled workers and students from the EU, and giving “due regard” the European Courts of Justice was too far for many Eurosceptic Conservative MPs – and for the Brexit minister David Davis. As Sunday night moved into Monday morning, Davis announced that he was resigning from the Department for Exiting the European Union. Davis was nominally in charge of Brexit but in practice had been usurped by Theresa May’s most trusted aide Olly Robbins. In the previous six months Davis – who is not known for his grasp of detail – had spent less than hours in talks with European Commission chief negotiator Michel Barnier. In his resignation letter, Davis told May that he was “unpersuaded” that the government’s negotiating approach “will not just lead to further demands for concessions” from Brussels. “The general direction of policy will leave us in at best a weak negotiating position, and possibly an inescapable one,” he added. Theresa May had hoped to wake Monday to her first week in control of her cabinet since last June’s disastrous general election when the Conservatives lost their overall majority in the Commons, forcing them to rely on the support of Democratic Unionist MPs. Instead, the prime minister had lost her Brexit secretary and rumours were swirling of who would go next. Nominally Johnson was foreign secretary – one of Britain’s ‘great offices of state’ – but, in reality, he ran a freelance operation geared around manoeuvring himself into Number 10 Downing Street. The concept of collective cabinet responsibility was an alien one as Johnson penned 4,000 pieces in right-wing broadsheets attacking May’s Brexit plan. But the prime minister was unable to sack the most prominent Brexiter in her cabinet; to do would risk mutiny from her Eurosceptic backbenchers. When Johnson did finally go – early on Monday afternoon – it was simultaneously surprising and inevitable. Johnson seemed set to stay until Davis’s resignation forced his hand. With the Brexit minister gone, Johnson would struggle to explain why he was still supporting a Chequers deal that he had told the press privately was a ‘turd’. But there was little strategic logic to Johnson’s decision to leave. Pro-Brexit Tories for whom any continued relationship with the European Union is anathema lack the numbers to force May out. This point was tacitly acknowledged by another resigning cabinet minister – junior Brexit secretary Steve Baker – who noted that “arithmetic” might “constrain the Government’s freedom of action”. Baker will return to where he has always been: the anti-EU Tory backbenches. Indeed, within meetings of his resignation he had already been once again made an administrator of the WhatsApp group controlled by the European Research Group, the rather incongruously titled cadre of hardline Brexiters led by the priggish Jacob Rees Mogg. The ERG supports leaving both the Customs Union and the Single Market – a pledge made by May herself in her Lancaster House speech last January – but which is opposed by most businesses and is incompatible with the commitment to no border in Ireland. With three ministers gone, febrile talk grew of a leadership challenge. But shifting May is not easy: under the rather arcane Conservative party rules, a vote of no confidence is triggered by at least 15 per cent of Tory MPs requesting one by writing to the chairman of the party’s backbench 1922 committee. Graham Brady, the 1922’s chairman, keeps names of those writing the letters confidential – and does not provide a running tally – but we do know that the 48 MPs needed currently to trigger a vote of confidence has yet to put pen to paper. If they do, there is every chance that May could survive a vote amongst her own MPs, many of whom are wary of another general election with Jeremy Corbyn’s Labour party narrowly ahead in the polls. Even if May were to be defenestrated, a Conservative leadership contest could take months – and might not radically change the content of the UK’s Brexit plans. “It is easy for the Brexiters to criticse the plan and the prime minister but they don’t have a clear rallying point to circle around,” says Simon Usherwood, senior lecturer in politics at the University of Surrey. This lack of an alternative Brexit plan has been a constant feature of British politics since the vote to leave. Last week’s Chequers tête-à-tête was the first time the UK cabinet had sat down to discuss want Britain should look like outside the European Union. A referendum won on soundbites – ‘take back control!’ – and slogans daubed on the side of brightly coloured buses, bequeathed a paralysed political system. Britain had voted to leave the European Union, yes, but how should it leave? Nobody can quite agree. But true Brexit believers are still a minority. For most Conservative MPs party unity – and their own parliamentary seats – are more important than Brexit red lines. There is even a small Tory cabal, led by former attorney general Dominic Grieve, that is actively pushing for the UK to stay in the single market by following Norway’s model by joining the European Economic Area. The opposition benches are no less ideologically cluttered. Throughout four decades in politics, Jeremy Corbyn has never been a Europhile. Officially his Labour party is in favour of staying in customs union and leaving the single market. But as many as a hundred pro-EU Labour MPs oppose the party’s line on Brexit, with many wanting to see a second referendum on any deal. May’s Chequers plan – fleshed out in a White Paper released Thursday – represents the first time the UK government has set out what It wants from the Brexit process. But in attempting to define what was previously a constructive ambiguity, May has exposed huge fissures, both within her own party and across British politics. On the hoary problem of the Irish border, the Chequers plan recognised the backstop for Northern Ireland agreed last December with the EU. Leo Varadkar welcomed the proposals, saying the EU “could be flexible too”, but the Democratic Unionists upon whom May depends for her parliamentary majority were far more muted. The DUP MP group includes some of the most fervent Brexiters in Westminster. The public reception to the Chequers plan has been equally lukewarm. A midweek poll found only 14 per cent of respondents thought it was good for Britain. (More than half did not know.) The prime minister herself has made little attempt to sell the merits of the deal, leaving much of the media to her newly appointed Brexit secretary – and trenchant Eurosceptic – Dominic Raab. Indeed, the Chequers proposals are not an easy sell. Brexiter wails that it represents ‘the worst of all worlds’ are not without merit. The putative new customs partnership with the EU is fiendishly complicated and would place onerous bureaucratic demands on business – flying in the face of the long-running Tory lines about EU ‘red tape’. Brexiters’ fear that by keeping so close to the EU’s orbit, the UK will not be able to realise the vision of ‘Global Britain’ constructed during the referendum to avoid the (valid) accusations that fear of immigration was driving the leave vote. 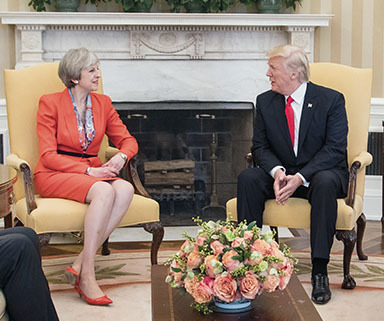 There is palpable enthusiasm among sections of the British media and political establishment for free trade deals with the US and elsewhere as an alternative to the EU. That such deals would come at a price – most likely felt by British farmers and manufacturers – and amid a global turn towards protectionism has received less attention. At the same time, the Chequers proposals would likely leave the UK economy in a much worse position that staying in the EU. Services – four-fifths of the UK economy – would be outside the Single Market, with the threat of barriers to trade. The City of London could be badly hit. Major business interests are warning of a serious disruption to both production and sales. Whether the UK’s White Paper will survive until October’s crunch talks with the EU27 is unclear. It provides a potential basis for a negotiation with the EU but it will not be acceptable to Brussels in its current form – the whiff of freshly picked cherries is far too strong. But any further softening of Theresa May’s malleable red lines could see more ministerial departures, and more no confidence letters to the 1922 committee. The prospect of Britain leaving the EU without a deal still remains. Brexiters have signalled that they could stymie the progress of any deal through Parliament. That could prove a successful tactic: if Westminster does not agree on a deal before 11pm on 29 March next year, the UK will crash out of the EU. The warnings of a ‘no deal Brexit’ are dire – including, this week, the possibility of stockpiles of tinned fruit and a flotilla of electric generators to power Northern Ireland. Whether this is all remains ‘Mad Max fantasy’ will depend on May’s ability to deliver an alternative deal that can command cross-party support – a difficult challenge in partisan British politics even in fair weather. Leaving the European Union is often described as ‘leaving a club’. But the UK is discovering that it more like a computer operating system: having run on the customs union and, latterly, the single market, for 45 years, almost everything Britain does is connected to the EU in some way. Building a new operating system cannot be done overnight – and comes with huge risks about its efficacy and efficiency. This piece appeared in the Irish Independent, July 14.